PLEASE NOTE...... ! ! ! Chromed steel. 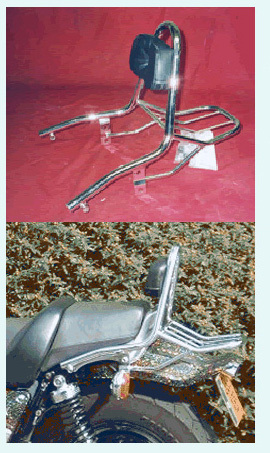 Fits to Original Yamaha 'Grab-Bar'. Good all rounder with soft back pad, re-mounts indicators lower. 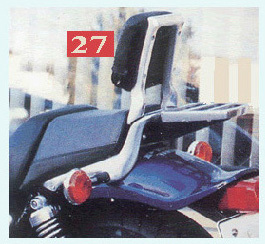 note: will not fit with Genuine Yamaha Sissy Bar. As per #44 above, but without rack. 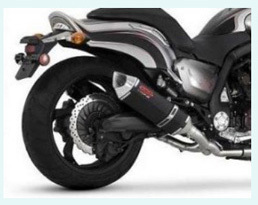 4L: 4" shorter than original rear mudguard, whilst keeping the original style. Injection moulded plastic (the original, quality made items), perfectly smooth inside and outside, does not warp, bubble up after time/heat, constant 3mm wall thickness (unlike all fibreglass copies!) It has the bonus of being lighter in weight than original as you do NOT use the standard steel undertray. 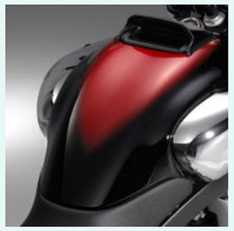 Includes LED Stop / Tail light assembly & registration plate bracket. Wiring supplied with simple Instructions. Helps the engine breathe better taking the strain off the original breather box and stops oil being forced up to the airbox. (then 'seeping' over the carbs). 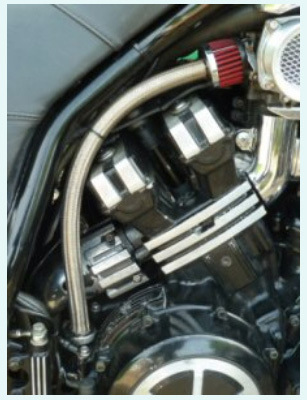 Includes screw in oil filler nozzle, stainless braided hose, and red 'K&N' breather filter. 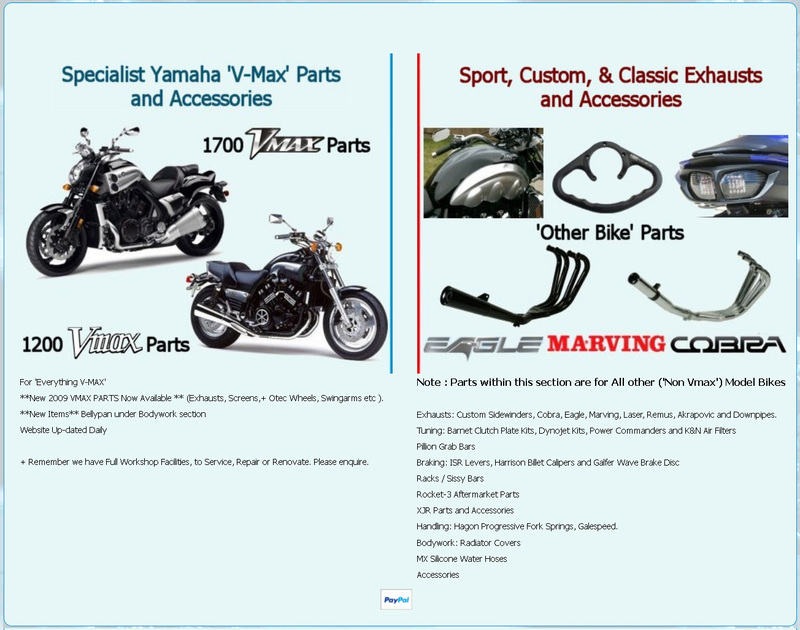 Totally boost the look of your Bike! with these aluminium CNC machined set of 4 pieces. Complete with necessary screws to fit in seconds. Original Length is 32mm - 1 1/4" , Short Length is 16mm - 5/8". 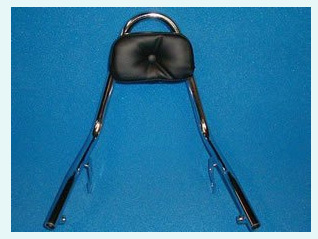 Note: Not supplied with mesh etc..
Can be used with Standard Air Scoops, or our 'Mega Air-Scoops'. Many different styles of CNC machined replacement engine and cover casings. Myself 'H', coming primarily from the automotive design and tooling industry as a Patternmaker / Model maker, 'Exactrep' was formed in 1986 for the development of Prototypes and Tooling for other Manufacturers, though quickly moving onto developing products of our own. 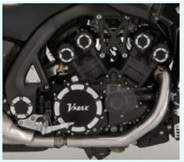 Since 1994 have designed & manufactured more body and mechanical parts specifically for the 'V-Max' than most other suppliers could ever dream of. When stock items are ordered by credit/debit card (ideally before 3.00pm) they are dispatched immediately for next-day delivery in mainland UK, or within a few days worldwide! 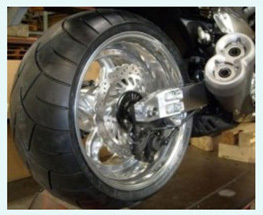 Alternatively, leave the fitting of the parts you've chosen to us, at very competitive rates. 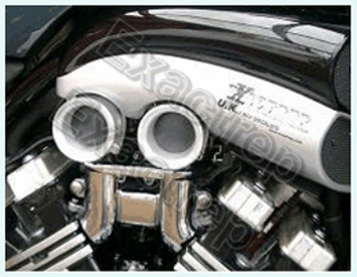 We can also rebuild or renovate your VMax. We let our customers call us 'the experts'. . . keep one wheel down. From 2-stroke Suzuki GT 500s/750s etc in the mid 70's and whilst working in/for/with various bike shops and tuners in the U.K, drag racing my own self built and tuned 1972 Kawasaki 750 H2 triple 2 stroke (still own now), finishing 5th in the National Street bike Drag racing Final in 1984, running with Carburettors sourced directly from close friends Roz and Norm at the U.S 'Lectron Fuel Systems' facility then in Detroit (now Texas). Then having the experience of building and tuning at the tracks the Harley XR750 "flat tracker" of John Coopers whilst crossing the USA in the '81' season with the U.S racing legend Bart Markel. Having owned my First 'V-Max' (the same '85' model I still ride now) since January 1988, I learnt the rudiments of the bike and its engine whilst 'drag - racing' it. (Best time then in bog standard trim 10.99 sec / 121 mph s/s ¼ mile). At these venues, track meetings and talking with other V -Max devotees many times and, resulted in February 1992 forming "The V-Max Club UK" The only officially recognised club in the UK and then running as Club Chairman for a further 5 + years, liaising with other clubs worldwide & attending many European Rallies & joining the original US club (VMOA #014) since 92/93 of which I still have close ties (+ many friends therein worldwide), at present in the position of the UK club "regalia man". 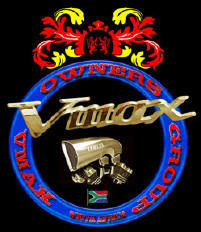 "You obtained this INFO from our South African Vmax Owners Group" site ....... ! ! !